Prominent & Leading Exporter from Gurgaon, we offer eye shield clear, milky eye shield, alcohol retaining well instruments, globe fixation ring, flap protector double end and manipulator hook. Ophthalmic UzeOnce-Clear Eye Shield used as a shield to cover a bandaged eye for treatment of injuries or after cataract/ refractive surgery. These are available in sterilized and non-sterilized packs for convenience of storage & single usage. We are a manufacturer and supplier of single use surgical instruments & medical devices that spell quality, safety and affordability. All our products are CE marked, manufactured in an ISO 13485 certified production facility. Packaging Details: one box contains 50 units each individually pouched pack. 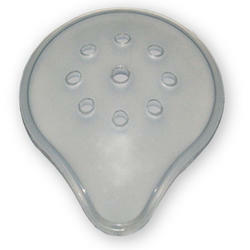 Ophthalmic eye shield are precisely contoured, plastic dish to cover the eye during any medical procedure. The eye cover is conducive to access the nose-bridge and temples and allows the doctor to operate smoothly around the designated area without causing any discomfort to the patient. Applications: Used as a shield to cover a bandaged eye for treatment of injuries or after cataract/refractive surgery. Product's USP: 1. Fits both Left or Right eye. 2. Highly flexible and soft contoured for comfort. 3. Transparent variants eliminate visual distortion. Packaging Details: one box contains 50 units each individually pouched packed. UzeOnce offers all plastic Alcohol Retaining Well with a central ring preferred for LASEK. These are made up of superior quality biocompatible plastic and are made for single use, thus these are hygienic & do not transmit any infection. Alcohol retainer & Alcohol well are some alternative terms that are used for alcohol retaining wells. Applications: To hold alcohol in the ring cavity for protecting the cornea during the LASIK / LASEK procedure. UzeOnce Globe Fixation Rings are complete plastic instruments with a crescent shaped outer edge and a semi-circular inner ring. The inner ring has blunt points that aid in accurate holding of eyes for refractive procedures. Available in affordable prices these are at par with international quality standard & are certified for so. The fixation rings are also termed as fixation ring / swivel fixation ring / Scleral fixation ring / Thorton ring etc. Flap protector double end for lasik (also known as flap lifter, flap manipulator, and corneal flap hook) offered by uzeonce is a complete plastic instrument with oar shaped double end. These are precisely designed to deliver accurate result in lazer / refractive surgery. Applications: Manipulate the corneal flap during lasik/lasek refractive surgery. 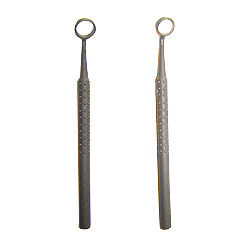 Commonly known as Iris Hooks, Kuglen Hooks, Rotators these ball manipulators have stainless steel tip and plastic handle and a steel ball is attached to the tip at the end. The ball ensures smooth manipulation without any problem to the doctor / surgeon. 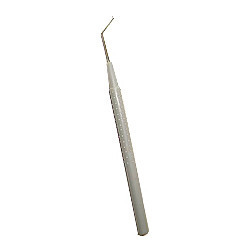 UzeOnce Capsulorhexis / Utrata Forceps are single-use disposable instrument that is suitable for cutting anterior capsule. 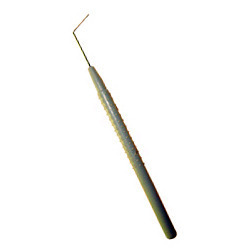 It has long bent tip with iris stop and is made up of bio-compatible plastic with steel tips. 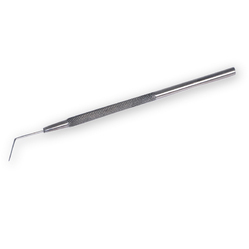 We offer corneal forceps. A straight shaft forceps with serrated platform & precise tips with a overall length that is convenient for the surgeon to use. 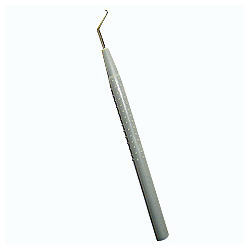 Made up of complete bio compatible plastic & steel tips these corneal forceps or even known as toothed forceps, bonn forceps etc. Applications: To hold the corneal tissue delicately during eye surgery. Uze once disposable tying forceps are plastic forceps with steel tips. 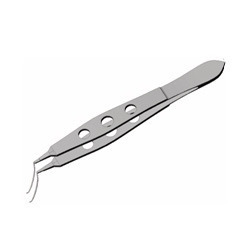 These forceps are designed & developed with compete accuracy to ensure good grip & optimum performance while tying sutures. 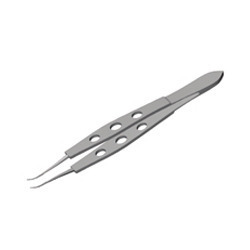 These forceps are commonly termed as suture forceps, suture tying forceps etc. UzeOnce Iris Repositor / Iris Spatula is a manipulating hook with stainless steel tip fitted on plastic handle & the end of the hook is a malleable flattened strip. Made up of qualitative raw materials these manipulators assure high performance & safety. Applications: Used to manipulate the iris. The phaco chopper with sharp end is best-suited manipulator for cataract surgery. 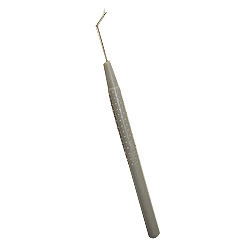 The end of the hook is a cutting head with sharp edge that delivers accurate cutting effect. This manipulator is also known as chopper, nucleus chopper and sharp chopper more commonly across the industry. 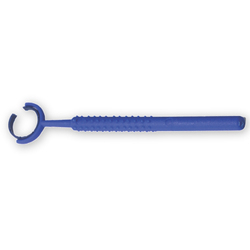 UzeOnce Phaco Hook seven known as Nucleus Hook / Phaco Rod is best manipulating hooks with stainless steel tip & a precisely designed plastic handle with good grip. The hook gradually tapers towards the end ensuring convenient manipulation during surgery. 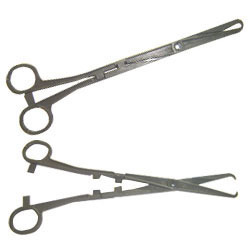 These long lockable crossed tiped Pozzi / Tenaculum Forceps / Grasping Forceps are used in intrauterine procedures. 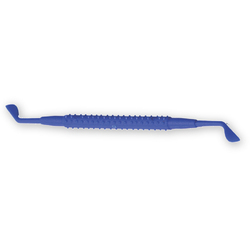 The forceps is accurately designed for good grip & comfort. Product's USP: First-class gripping, long handle to reach places with difficult access. These manipulating Sinskey hook eye hooks with stainless steel tip and plastic handle is convenient to use & delivers precise result due to its accurate design & construct. The tip is bent to form a hook and assures exact manipulation as desired by the doctor. 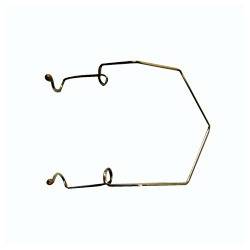 These hooks are also known as IOL hooks across the health care industry. Wire speculums are made of flexible stainless steel wire with bulbs at end & are comfortable to obtain additional traction for the upper eyelid. Our uze once wire speculums / eye speculums are widely proffered by global consumers for their precise design, high performance & affordability. Applications: To keep the eyelids apart and prevent blinking during examination/surgery. The Y manipulator / Y rotator has stainless steel tip and plastic handle and the tip ends in an Y shape. 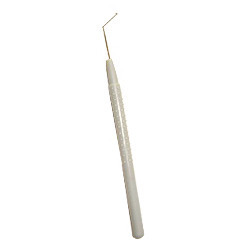 UzeOnce manipulators are available in sterile packs and are for single usage. We offer Corneal Trephine - LASEK. Made up of superior grade biocompatible plastic this Trephine / Corneal Marker / LASEK Trephine has a central ring with a sharp rim. The blade is sharp & sleek to perform desired operation. These are available in sterile packs & are made for single usage. Being disposable they do not transmit any infection. Applications: To mark an indentation in the corneal epithelium during the LASEK procedure.